From the Friday, November 2, 2012, Daily Mining Gazette. The exhibit opening was a great success with over 70 people in attendance. 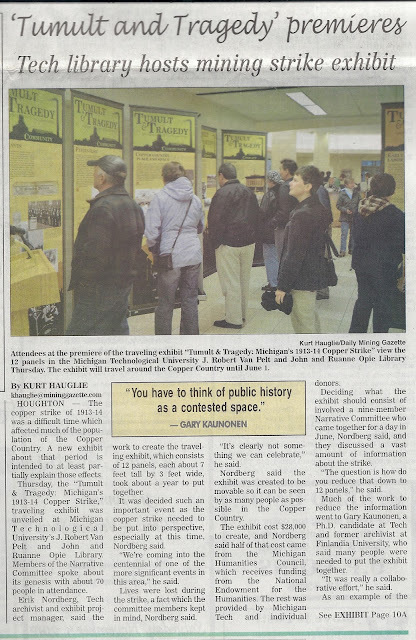 The Project Director, Erik Nordberg, began comments on the exhibit, then I (Gary Kaunonen) as Project Historian talked briefly about the exhibit's research and writing, and then Mike Stockwell, Project Designer, talked about the original artwork and design of the traveling exhibit panels. It was a fun night and a number of people from the Narrative Committee, who helped brainstorm for the exhibit, were in attendance as well, including Larry Lankton (retired Tech history prof), Deidre Erbisch (local school teacher), and Carla Strome (local school administrator).